Giamatti was one of those tormented Red Sox fans of the 20th century. Their autumns and winters were never warmed by the memories of a championship, only the torturous thoughts of “what if?” He died in 1989, while in office as the commissioner of Major League Baseball, a few weeks before the Red Sox swooned again in September and lost the American League East title to the Toronto Blue Jays. 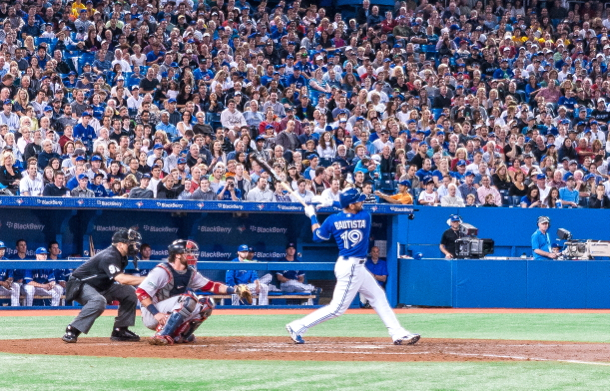 Back then, the Jays and Red Sox were similar because their fans shared a sense of doom. While what Torontowent through was nowhere near the devilish grief Boston endured for 86 years, the Blue Jays had suffered monumental and historic collapses. In 1985, they led the best-of-seven American League Championship Series against the Kansas City Royals 2-0 and 3-1, but George Brett’s bat blasted the Jays into winter earlier than anyone in Canada wanted, and baseball fans in Toronto became familiar with the meaning of the term “die-hard.” The pain became more intense after the team lost its final seven games in 1987 and missed the playoffs, even though it appeared for months that Canada’s first World Series title was a certainty. Blue Jays supporters went through a discontented winter waiting for redemption and the sense of hope that flourishes in the sport each April. But 1988 was a failure and 1989 started out terribly and the Oakland A’s had assembled a juggernaut that dispatched the Jays with ease in the playoffs. Even though the Blue Jays owned baseball’s best cumulative record over a six-season period dating to 1984, it seemed like the window of chance had closed like an umpire’s fist on a strikeout call. The rest you know. On December 5, 1990, the Blue Jays revamped their lineup — and their identity — through trades and free-agent signings. They reached the postseason from 1991-93, and won back-to-back championships, bringing euphoria to the city, as well as an indelible source of pride for all of those who zealously followed the team from spring to fall, season after season. Fans today may find it hard to believe, but the Blue Jays once were the most successful team in baseball, becoming the first franchise to draw 4 million fans, selling out home games at the SkyDome (now Rogers Centre) at record levels. In recent years, the same stadium has seen its attendance rank among the lowest in baseball, with the Jays averaging just 25,921 fans in their 81 home games in 2012. As Opening Day arrives, however, change comes with it. In 2013, the Blue Jays are in a position they haven’t been for two decades: They enter the season as World Series favourites. The addition of three elite starting pitchers — Cy Young Award winner R.A. Dickey, Mark Buehrle and Josh Johnson — as well as All-Star position players Jose Reyes and Melky Cabrera ensure the Blue Jays will be one of the most exciting teams to watch. The offseason moves have rekindled thoughts of the feats former general manager Pat Gillick pulled off in the early 1990s. Whether this team truly can bring the glory days back to Toronto will not be revealed for months. For now, what we do know is the electricity that has been absent during the past 20 years — as the Jays have failed to come within even a warning-track flyball of the postseason — will be back. They are going to be competitive. Game days will be exciting, bars and restaurants will be full, hotels will enjoy a boost with visitors coming in to see the hottest show in town.